José María Hipólito Figueres Ferrer (1906-1990) was a Costa Rican coffee rancher, politician, and agitator who served as President of Costa Rica on three occasions between 1948 and 1974. A militant socialist, Figueres is one of the most important architects of modern Costa Rica. Figueres was born on September 25, 1906, to parents who had moved to Costa Rica from the Spanish region of Catalonia. He was a restless, ambitious youth who frequently clashed with his straight-laced physician father. He never earned a formal degree, but the self-taught Figueres was knowledgeable about a wide array of subjects. He lived in Boston and New York for a while, returning to Costa Rica in 1928. He purchased a small plantation which grew maguey, a material from which heavy rope can be made. His businesses prospered and he turned his eye towards fixing the legendarily corrupt Costa Rican politics. In 1940, Rafael Angel Calderón Guardia was elected President of Costa Rica. Calderón was a progressive who reopened the University of Costa Rica and instituted reforms such as health care, but he was also a member of the old-guard political class which had been ruling Costa Rica for decades and was notoriously corrupt. In 1942, the firebrand Figueres was exiled for criticizing Calderón’s administration on the radio. Calderón handed power to his handpicked successor, Teodoro Picado, in 1944. Figueres, who had returned, continued agitating against the government. He ultimately decided that only violent action would loosen the old guard’s hold on power in the country. In 1948, he was proven correct: Calderón “won” a crooked election against Otilio Ulate, a consensus candidate supported by Figueres and other opposition groups. Figueres was instrumental in training and equipping the so-called "Caribbean Legion," whose stated aim was to establish true democracy first in Costa Rica, then in Nicaragua and the Dominican Republic, at the time ruled by dictators Anastasio Somoza and Rafael Trujillo respectively. 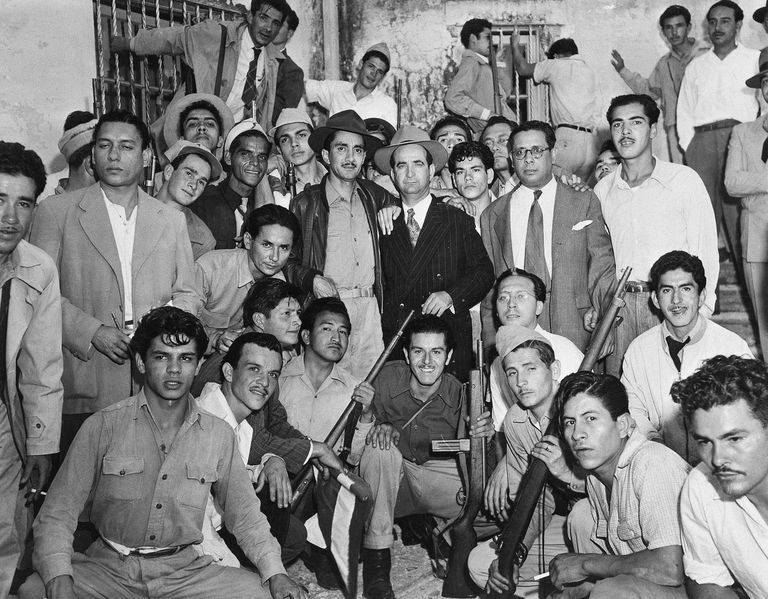 A civil war broke out in Costa Rica in 1948, pitting Figueres and his Caribbean Legion against the 300-man Costa Rican army and a legion of communists. President Picado asked for help from neighboring Nicaragua. Somoza was inclined to help, but Picado's alliance with Costa Rican Communists was a sticking point and the USA forbade Nicaragua from sending aid. After 44 bloody days, the war was over when the rebels, having won a series of battles, were poised to take the capital at San José. Even though the civil war was supposed to put Ulate in his rightful position as President, Figueres was named head of the “Junta Fundadora,” or Founding Council, which ruled Costa Rica for eighteen months before Ulate was finally handed the Presidency he had rightfully won in the 1948 election. As head of the council, Figueres was essentially President during this time. Figueres and the council enacted several very important reforms during this time, including eliminating the army (although keeping the police force), nationalizing the banks, giving women and the illiterate the right to vote, establishing a welfare system, outlawing the communist party, and creating a social service class among other reforms. These reforms profoundly altered Costa Rican society. Figueres handed over power peacefully to Ulate in 1949 even though they did not see eye-to-eye on many subjects. Ever since, Costa Rican politics have been a model of democracy with peaceful transitions of power. Figueres was elected on his own merits in 1953 as the head of the new Partido Liberación Nacional (National Liberation Party), which is still one of the most powerful political parties in the nation. During his second term, he proved adept at promoting private as well as public enterprise and continued to antagonize his dictator neighbors: a plot to kill Figueres was traced back to Rafael Trujillo of the Dominican Republic. Figueres was a skillful politician who had good ties with the United States of America in spite of their support for dictators like Somoza. Figueres was re-elected to the Presidency in 1970. He continued to champion democracy and to make friends internationally—for instance, although he maintained good relations with the USA, he also found a way to sell Costa Rican coffee in the USSR. His third term was marred because of his decision to allow fugitive financier Robert Vesco to stay in Costa Rica; the scandal remains one of the greatest stains on his legacy. Allegations of corruption would dog Figueres his whole life, although little was ever proven. After the Civil War, when he was head of the Founding Council, it was said that he reimbursed himself lavishly for damages sustained to his properties. Later, in the 1970’s, his financial ties to crooked international financier Robert Vesco strongly hinted that he had accepted indirect bribes in exchange for sanctuary. At only 5’3” tall, Figueres was short of stature but had boundless energy and self-confidence. He married twice, first to American Henrietta Boggs in 1942 (they divorced in 1952) and again in 1954 to Karen Olsen Beck, another American. Figueres had a total of six children between the two marriages. One of his sons, José María Figueres, served as President of Costa Rica from 1994 to 1998. Today, Costa Rica stands apart from the other nations of Central America for its prosperity, safety, and peacefulness. Figueres is arguably more responsible for this than any other single political figure. In particular, his decision to disband the army and rely instead on a national police force has allowed his nation to save money on the military and spend it on education and elsewhere. Figueres is fondly remembered by many Costa Ricans as the architect of their prosperity. When not serving as President, Figueres remained active in politics. He had great international prestige and was invited to speak in the USA in 1958 after US Vice-President Richard Nixon had been spat upon during a visit to Latin America. Figueres made a famous quote there: "the people cannot spit at a foreign policy." He taught at Harvard University for a while and was distraught at the death of President John F. Kennedy, walking in the funeral train with other visiting dignitaries. Perhaps Figueres' greatest legacy was his steadfast dedication to democracy. Although it is true that he started a Civil War, he did so at least in part to redress crooked elections. He was a true believer in the power of the electoral process: once he was in power, he refused to act like his predecessors and commit election fraud in order to stay there. He even invited United Nations observers to help with the 1958 election in which his candidate lost to the opposition. His quote following the election speaks volumes about his philosophy: "I consider our defeat as a contribution, in a way, to democracy in Latin America. It is not customary for a party in power to lose an election." Adams, Jerome R. Latin American Heroes: Liberators and Patriots from 1500 to the Present. New York: Ballantine Books, 1991. Foster, Lynn V. A Brief History of Central America. New York: Checkmark Books, 2000. Why Did the USA Occupy the Dominican Republic in 1916?